Production of the Chevrolet Equinox, GM's top-selling crossover in the U.S. and Canada, was halted on Sept. 17 at the CAMI plant, which employs about 2,750 people. General Motors of Canada has reached a tentative deal with members of the Unifor union after a monthlong strike at the Ingersoll, Ont., plant that makes the Chevrolet Equinox. The company announced the agreement in an email late Friday. No details were provided pending a ratification vote. 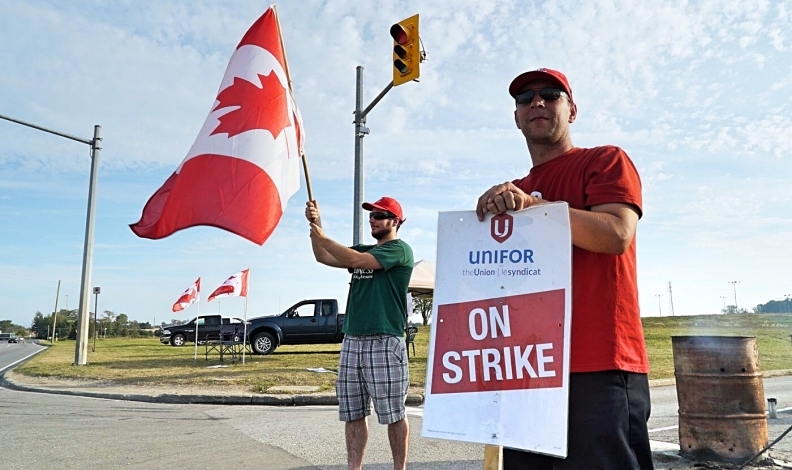 Unifor Local 88 President Dan Borthwick told Automotive News Canada that his members are scheduled to vote on the contract Monday morning, Oct. 16, in nearby London and could be back to work late that day. The deal comes a day after the Government of Ontario urged the two parties to immediately resolve the strike following a threat by GM to move all Equinox production to Mexico. Ontario Premier Kathleen Wynne issued a statement expressing hope that the tentative deal will end the strike, which she says has been felt throughout the province's auto supply chain. Unifor had demanded the plant be named the lead producer of the Equinox. That meant if GM needed more of the compact crossover, CAMI would be first to get the work but if sales slowed, production would be scaled back first at a pair of plants in Mexico. The Mexican plants had combined to build 40,017 Equinox crossovers between April, when overflow Equinox production began there, and Aug. 31. Meanwhile, CAMI had produced 132,288 Equinoxes this year through August, according to the Automotive News Data Center. GM had already sent GMC Terrain crossover production to a Mexican plant from CAMI earlier this year. The move resulted in the loss of about 600 jobs at CAMI, including about 200 workers that took buyouts or early retirement packages. During the strike, U.S. inventory of the Equinox dropped to 43,453 vehicles, or a 41-day supply, at the beginning of October, according to the Automotive News Data Center. Inventory stood at an all-time high of 74,400 units, or a 66-day supply, in June. Supply levels in Canada aren't available. U.S. sales of the Equinox surged 80 per cent last month to 27,512 and deliveries total 212,735 through September, up 22 per cent. Meanwhile, Canadian Equinox sales rose 27 per cent to 2,079 in September. Through the first nine months of 2017, Canadian sales are up 38.5 per cent over last year. The vast majority of vehicles produced at CAMI are shipped to the United States. The walkout, which began Sept. 17, has been the longest strike in 25 years at the Ingersoll factory.